Well i finished my gear change and the only stupid thing i did was install the carrier pin before i replaced the axles lol. I was so excited about getting a good contact pattern i got ahead of myself. Man do those gears make a diff. Well I've got front bushings and ball joints on the way. 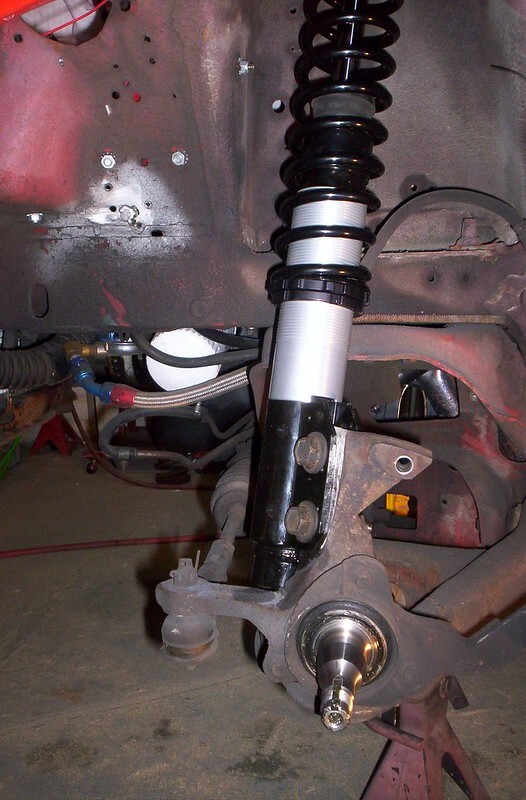 Also picking up a set of struts tomorrow as well. Hopefully riding fine by wed instead of rattling down the road. Yes I understand that most people on here will tell you that it's worth changing to the later spindles for the better brakes and to go to 5 lug wheels, but to me that's a matter of perception. I never had any problem slowing from a 118 trap speed with my puny brakes, nor did I ever feel disadvantaged with 4 lug wheels. Right or wrong the way I saw the bigger brake issue is that I can lock the front wheels with the brakes I have now so how could having more braking power up front help? Granted that over repeated braking there would be less fade with bigger brakes, so that might be a factor if you daily drive the car. I agree, other than more choice in 5 lug wheels I also do not see the advantage in the" better" brakes. I have driven on freeways and have had to make a couple of panic stops in a row and very little fade, could still lock them up when heated. So there must be something I don't understand, please school me on this. Maximum braking force does not include being able to "Lock up" the brakes front or rear. That is not an indicator of how "Good" the brakes are. 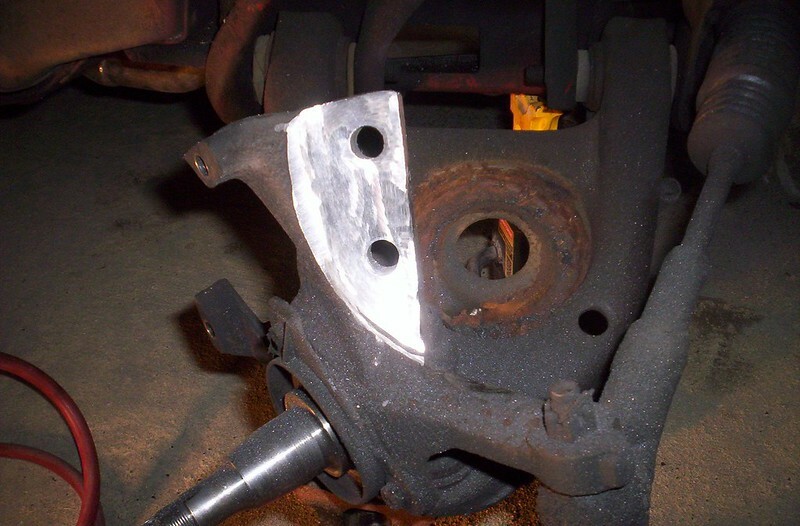 Virtually any brakes can be "Locked Up" with nothing more than stabbing the brakes at high speeds. Braking performance should be judged by overall stopping distance, fade resistance, repeat-ability, some other points, and overall driver feel and confidence. How you drive the car, where you drive the car, and what you expect from a car can have a huge affect on what you consider "Good Brakes"
Obviously, driver, road conditions, tires, weather conditions, etc. will all have an affect on the overall braking performance and stopping distances. The 87+ V8 brakes are an improvement over the Four Eyes setup. If you are a cruiser that doesn't push your car to the limits or you only need heavy braking occasionally such as the end of the drag strip, then there may be no need to swap out for the later model setup. Also adding a set of high quality pads to the front brakes on the Four Eyes will make a huge improvement in most cases. I was mostly going for the additional choice in struts with braking being an added benefit. I love my turbine wheels and don't see changing them in the near future. I did think about having my spindles machined and it did make me wonder about grinding them narrower. Something to consider i guess. Thanks for everyone's input. Did you grind everything from the outside or equally from both sides? Trey, I get your point. That all makes sense, I just use my car as a cruiser so my brakes have served me well. I just don't understand why it seems like most people who buy a fox with 4 lug seems desperate to change to 5 lug right away and they always mention it's for the better brakes. I think the newer tires have a better traction rating than the old school tires from the 80's so maybe there would be a big difference in stopping distance, as shown, had they had the stickier tires back in the day. If I am correct the best braking is just short of locking up, then it's all in road condition and tire traction. It's been 8 years since I did that and my memory isn't the greatest but I'm pretty sure I did all the grinding from one side. Also as I recall it wasn't really that much material to remove, I think 1/8" which went quick with an angle grinder. And while I'm sure the surface wasn't perfectly flat I've never had any problem with it. Well i guess my jeep got jealous again. Driving down the highway started to feel a vibration and thought maybe it was the rumble patterns they put in... WRONG lol. Pulled over and smoke was billowing from my 4wd driveshaft cv joint. Lucky me. I had a serious lead foot addiction and pretty well drove 140+ everywhere I went for a few years in my early 20’s. Burned up 7 sets of brakes in a two month period before I found out about performance compounds, etc. they sucked a lot less after switching and did not burn up nearly as often. Maxinum Motorsports makes a kit designed for the 87-93 spindle that does some good things. It still uses rear drum but stops in 114 ft from 60 mph. Comparatively the 1986 SVO which had the bigger calipers and 4 wheel disc was 159 ft. 1993 Cobra street version (4 lug) is 148 ft. Can’t seem to find stats on the 93 Cobra R but it ran SN95 brakes and 5 lug. I mostly went off on the brakes on my 86GT. 94-95 spindles, urethane bushings in the control arms, 99 GT dual piston calipers, Baer drilled and slotted rotors, high end pads, braided lines, 1” bore master cyl, complete 95GT rear end, adjustable proportioning valve, etc. I also crammed 245/45/17’s under it. That combo stops way shorter than many cars. Like right now type stopping. My good friend’s 86 has 2003 Cobra brakes in front and his stops the same but fades less on back to back punishment. For my 85 build I stayed 4 lug. I still went disc in the rear. Not sure what it will do but it should be pretty decent with the parts going on it. I’m expecting around 110 ft.
My son’s 86 with high end pads is in the 140 foot 60-0’realm. Last edited by erratic50; 04-17-2019 at 10:59 PM.